A guide about the basic features of ToB and also just basic TW features. Should be good for first time players and people who wonder what changed in ToB. 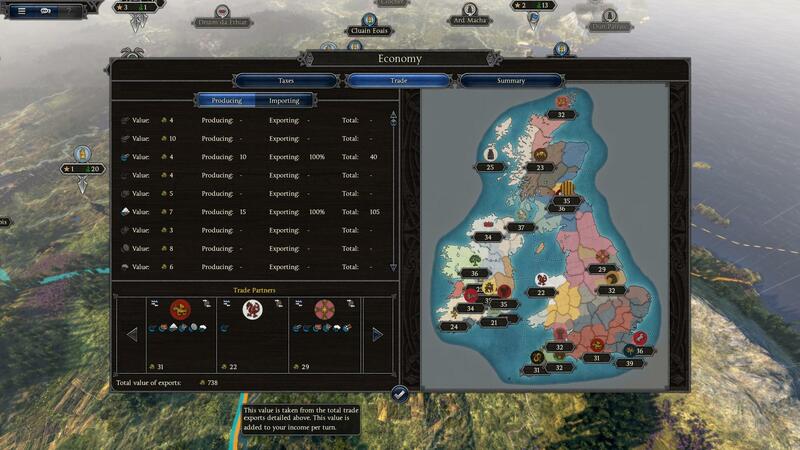 The game takes place on the British Isles with every faction's campaign starting in the year 878 AD, right after the defeat of the viking's 'Great Heathen Army' by king Alfred of Wessex. 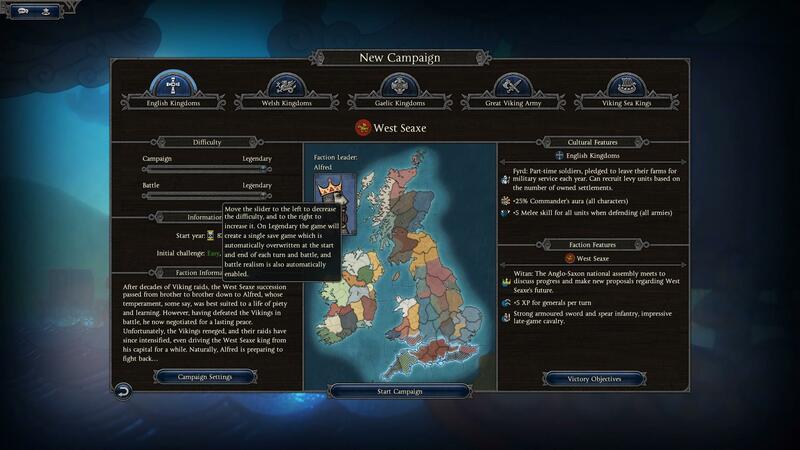 As with every total war game you will get to choose from a couple of factions to start a campaign with. These factions are divided in 5 cultures being: the Welsh Kingdoms, English Kingdoms, Gaelic Kingdoms, Great Viking Army and Viking Sea Kings. In total there's 2 factions for each culture (total of 10 different playable factions) and they all have different specialties and bonuses. Bonuses to factions depend on 1. The culture (each culture having specific bonuses visible when starting a campaign) and 2. the faction itself (each having specialties in units and specific bonuses). As is visible at the start menu of the game, there's a greyed out 'DLC' button which means there will likely be DLC. 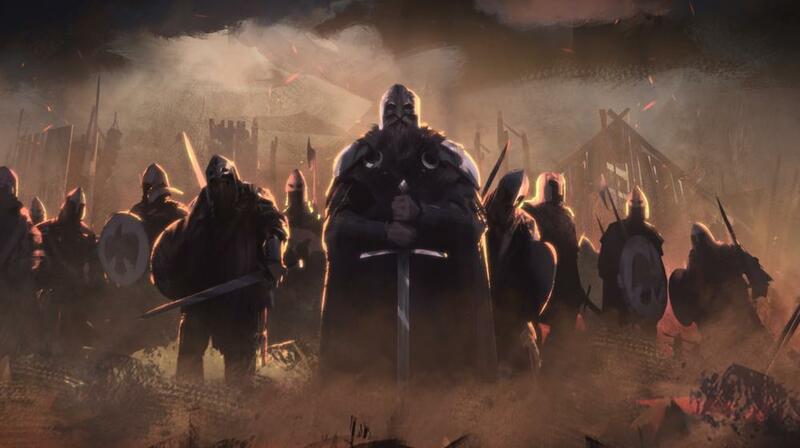 Most of the Time DLC takes the form of new playable factions or smaller 'campaigns', which means that the factions might change later on or a new 'setting' like for example 1066 (the 'official' end of the viking age) can be introduced. You've probably noticed on the store page and in the forums, but a lot of people are sceptical about this game or dislike the changes. I'll try to keep my own opinion out of this guide, but just want to say that the hours I've played this far have been enjoyable and that I certainly think I'll get my 1 euro = 1 hour 'target' of bang for buck. Your income per turn: Will be explained a bit more in the 'economy' section, but it pretty much tells you how much money you'll get next turn. Food Surplus: A new mechanic that ToB added. All your units and some of your buildings will have a 'food upkeep'. making new units or buildings with a food upkeep will lower the amount of food surplus you have. Having high food surplus gives you various bonuses to replenishment, while negative food surplus gives debuffs and also starves your supplies (more in the military section of the guide). War Fervour: Shows how weary/excited your people are for war. Having positive war weariness gives bonuses, while negative war weariness gives penalties. You can hover over it to see what is affecting your war fervour and act accordingly to increase it. the most obvious way to keep it stable is to be at peace. Culture/Faction specific mechanics: will give bonuses or can sometimes be used in events. 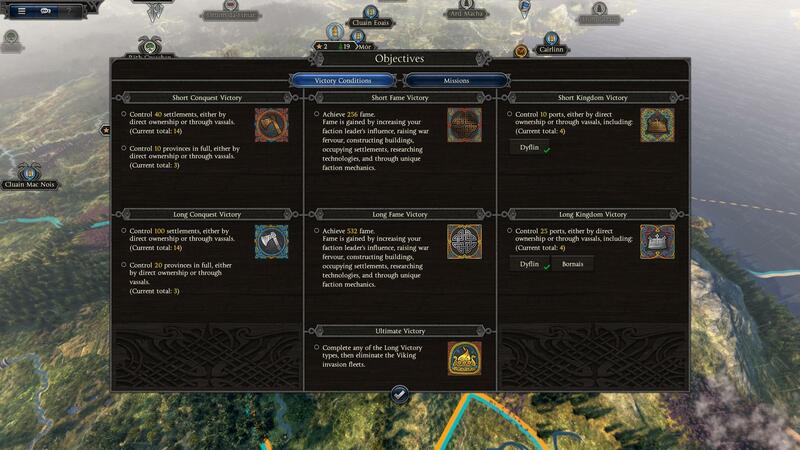 At the start campaign screen you can hover over each faction's mechanic and see what influences it and what bonuses it gives. Your faction bonus and your leader's influence: The end of the middle top window will give you information about your faction's bonus (visible when picking it on the start campaign screen) and other faction wide bonuses that can come about during events. Lastly you also see the effect that your leader's influence has, being the higher, the better. Influence can be increased with political actions and traits/wives. Contains various tabs which I will deal with in the various parts of the guide. What I will talk about here is 1 specific tab and also the tabs that you can see under the minimap. Objectives Tab: This tab could technically be seen as the most important one of them all as it tells you how to actually win the game. You've got different types and tiers of victories (short, long, ultimate in length and kingdom, fame and conquest in type). It's a good idea to at least check the conditions, but I just recommend not bothering with this tab too much unless you're achievement hunting or something. All things in due time. Event Messages: this tab gives you information about the various events that took place during end-turn. It goes from buildings being finished, to people being recruited, to war declaration, ect. It's a good idea to check this tab every turn and see what's new. Some of the events will be given to you in a prompt at the start of your turn, but others won't. The game seems to think that knowing your nephew had a kid named timmy is more important than hearing about the fact that one of your neighbours declared war on someone, which makes them a prime target while they're distracted. Armies Tab: Shows you your different armies, the amount of men they have, the amount of supplies they have and also their movement points. Supplies and movement points will be dealt with in the military part of this guide. Provinces Tab: Gives you an overview of your provinces, their public order, income and whether they're contested (green icon = whole province is yours, red icon = province is partially not yours). You can also see all the other province's income, which can be a good way to decide whether you'll take a province or not (the richer, the better). Factions Tab: Shows you all the different factions and how much they like you. 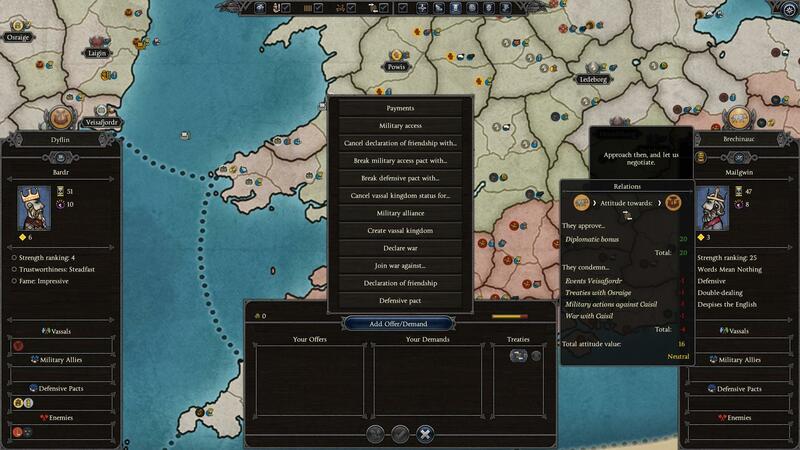 Can also be assessed in more detail in the diplomacy tab (diplomacy part of guide). Another important part of the UI is the lower right. The Hourglass icon is clickable and will end your turn. Ending you turn means all the other factions will get to play their turn and thus attack eachother, you, ect. Sadly enough this can be translated into how much you want to AI to cheat. Campaigns on 'easy' difficulty are incredibly easy, but that's because the AI doesn't get any boosts and has to play on a level playing field with you. The poor decision-making makes it so that they'll likely keel over and die if you as much as sneeze on them. Higher difficulties give the AI more buffs and the player more penalties. This gives an artificial feeling of difficulty and leads to a more difficult (and often more enjoyable and long lasting) campaign. Battle difficulty: Changes the bonuses the AI gets during battles. If I'm not mistaken then the AI gets various bonuses to their troops when playing on a higher difficulty, with the most obvious boost being morale (mechanic explained in military part). This will make the battles harder, but is once again rather artificial as instead of making the AI smarter, it just gives it more bonuses to make it last longer. The specific 'legendary' difficulty adds a bit more to the difficulty of 'Very Hard', but has the same penalties and bonuses to the AI. In Legendary your battle difficulty is also set to 'legendary' which means you'll be set on 'battle realisme mode' which takes away your ability to pause battles and give commands (you can still pause, but not give commands), takes away your ability to play in slow motion (very useful for new players to learn about battles as it gives you more time to make tactical decisions), takes away your radar (minimap showing friendly and enemy units) and it also restrict your camera movement. Honestly, legendary is a huge pain in the ♥♥♥, but seeing as though the last change is the fact that you CANNOT SAVE (the game auto-saves each end-turn and each battle), it also means that you can't save scum. I'll start with something pretty basic being the way you build up your kingdom and manage your economy. The most basic aspect of your economy is how much money you make each turn. You can easily see how much money your faction gets each turn by looking at the top middle part of the screen and looking at the number next to the gold coin (green if you are making money each turn, red if you are losing money each turn). hovering over the number will give you information about the total income and expenditures of your faction and the number itself is obviously income - expenses. If you want a more detailed overview of your income and expenses you can click the 'economy' tab on the top right of the screen or simply press the hotkey '5'. In this tab there are 3 subtabs which will each tell you something different about your kingdom's finances. Taxes: here you can see the amount of money you get from taxes, the effect the taxes have on your kingdom and also change the amount of taxes you demand. Taxes have 5 different 'levels' ranging from very low, low, average, above average to high. Each 'level' has different effects that change the public order in all your provinces and also the amount of food you get. Average taxes give no bonuses or penalties while lower taxes give - income, + public order (happier populace) and - food (less food taxed) and higher levels give + income, - public order (higher chance of rebellions) and + food (so you can sustain more units). Changing this value according to how things are going is a good idea (= if you have high public order in every province you might as well put the taxes higher). Beware that the penalties apply to every province you have, so just having 1 happy province and 4 unhappy ones isn't worth it. In case your provinces are too unhappy you can also choose to not tax a province by going to the 'province details' tab and unchecking the 'tax province' box. Trade: The trade tab shows which factions you're trading with, what you're trading (importing and exporting) and also how much money per turn you're getting out of trade. 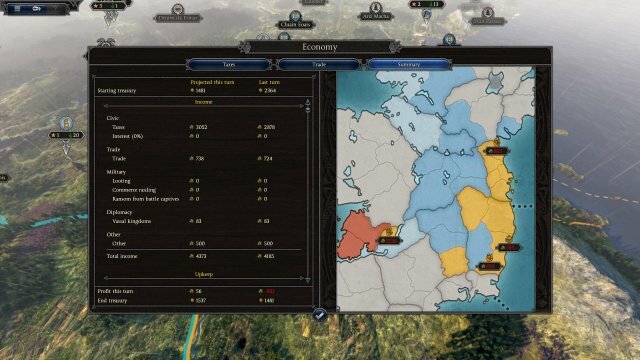 In previous Total War titles you needed to use diplomacy to ask for trade agreements with factions, but that feature has been streamlined in this installment and thus you will trade with every faction you've encountered as long as you're not at war with each other. Summary: The summary tab is pretty self-explanatory. You get a summary that you can scroll through for information about all the different factors that influence your income. I suggest taking a look at this tab in-game to learn about these different factors, but most are pretty basic and need no real explanation. one of these basic aspects you can see on the map on the right is the upkeep of my different armies (in red). 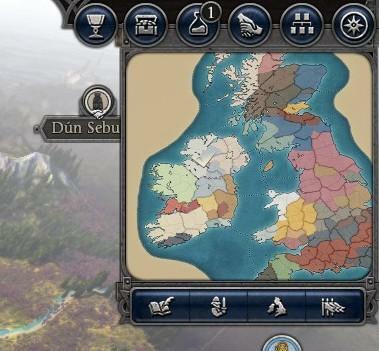 The map in ToB is divided in different provinces, each with their own major and minor settlements. Minor settlements have 1 or 2 buildings that are a kind of 'local specialty' being a farm, fishery, mine, ect., while major settlements are actual cities that have walls, a garrison and multiple building slots that can be unlocked by upgrading the main building. You have different effects for buildings that say something along the lines of x% industry/farms/churches. These buildings multiply the amount of money you get from other buildings in the province (at least, I think it's only province-wide and not faction-wide), the red/green face means that you get/lose x public order due to the building and the gold coin icon means the building generates x gold per turn. Other effects are pretty self explanatory or will be covered in other parts of the guide. Command: Useless for a governor, but great for a general. Try and keep high command nobles for generals and low command nobles as governors. Do not invest skill points in this aspect when using someone as a governor. Governance: in case the name isn't obvious enough, this is a very important stat for governors. It reduces corruption and construction costs in the province and at the last 'level' of 10 governance also adds a 25% bonus to income from 'market' type buildings. This aspect is influenced by the 'sribe' follower which also invreases overall income of a province. Zeal: this might not sound like a good stat for governors, but it actually is. Zeals increases the public order in a province and also adds a diplomacy bonus for your whole faction at Zeal 10. in case you're struggling with low public order in a province, having a high zeal governor is a life saver. Zeal is added by the 'bard follower' who isn't all that great for anything besides zeal when it comes to governors. This stat is still plenty useful though. Another important factor is that each noble character (both governors and generals) can have something called 'special traits' these can range from bad traits like 'strict' (which gives -3 public order) to 'just' (giving +3 public order). Checking a potential governor's special traits is important as it can distinguish a good governor from a bad one. A last important aspect for governors (and every character) is their wife. Wives are pretty much a commodity in this game (please don't burn me if any feminist reads this) and are primarily used for the buffs they give (I do not condone this behaviour). Wives can give stat buffs to their husband, but they can also give debuffs. Finding a good wife for your governor is paramount. That pretty much ends the basic discussion about income and kingdom building. Most of this stuff is evident and doesn't need much explanation, but I still wanted to give an overview. When playing and wondering about something related to economy your best bet is going to the economy tab or just looking for a gold coin icon and hovering over it (rule of thumb for Total War games: 'When in doubt, hover your mouse over it'). This is pretty much the snake in the grass of Total War. Not managing your politics can be a real catastrophe and will lead to rebellions, assasinations, blackmail, ... . It's not especially difficult to manage this aspect of the game, but it can get pretty expensive. The faction tab (hotkey 8) is where most of your politics will be happening. When opening the tab you might be a bit overwhelmed by all the numbers, icons, colours, ect. , but no worries, it really isn't that hard to manage. Influence: influence tells you how influential a person is. The most important thing is how influential your king is and how it compares to his vassals' influence. If a vassal has more influence than his king he will start to get thoughts of rebellion and will have a lower 'loyalty'. Loyalty: This is the second, and arguably most important, factor for politics. Loyalty depicts how loyal a vassal is towards your king and shows you how likely he is to rebel against you. loyalty is considered to be low at 2/10 and when it becomes 0 the vassal will rebel. I haven't had this happen to me yet, but I assume that or the character is a general and will rebel with his whole army, or the character is a governor/statesman (statesman = default character that is neither general nor governor) and will take over his province/a random settlement. Rebellions are an utter pain due to minor settlements not having garrisons, which means you should really do everything to avoid this. On the bottom left of the faction tab you can see multiple political actions (intigue) that you can take concerning the vassal in question (chosen by clicking on his/her portrait in the faction tab). Hovering over them will tell you what they do, but important to note is the fact that they cost (a lot of) money. Specific actions that increase loyalty are: adoption, securing loyalty (= bribe) or lowering the character's influence in case it exceeds your king's influence. Another viable option is just assasinating the character. Dead men can't betray you. Estates: these are some of those 'other' building effects I was talking about. Some buildings say '+ x estate(s)'. these can be assigned in the 'governors and estates' tab of the faction tab and can be used to increase a vassal's loyalty. Giving someone an estate increases their loyalty and influence. You can strip someone of their estate, but they'll hate you for that and lose loyalty, so most of the time it's a bad idea. Something very important is to make sure that your king doesn't hold too many estates. Nobles are greedy ♥♥♥ and easily get jealous,so sharing is caring. Offices: There are special offices that can be given to characters to increase their loyalty and other stats. once again like with the estates there's a limited amount of them and stripping someone of their office will make them unhappy. That's pretty much it for politics. It's not that difficult to manage, but can get expensive and is an important part of keeping your kingdom healthy. Checking your politics tab every couple turns is important and you should always check whether you've conquered any estates when you take land (since they automatically go to your king which makes the whiny nobles mad). This wouldn't be much of a strategy game if you were the only faction, so diplomacy is an important aspect of every TW game. It can give you information about who likes you, hates you, who is at war with who, and you can of course use diplomacy to make alliances, peace, war, arrange marriages, ect. the basic overview of the diplomacy tab (hotkey 7) shows you a whole lot of stuff. On the left you have information about your own kingdom: its strength ranking (a combination of military might and territory), your trustworthiness (influenced by betrayals and in turn influencing how much the AI trusts you/makes deals with you), your fame (how impressive your faction is) and then various alliances and your enemies. On the right side you can see information about the other factions. 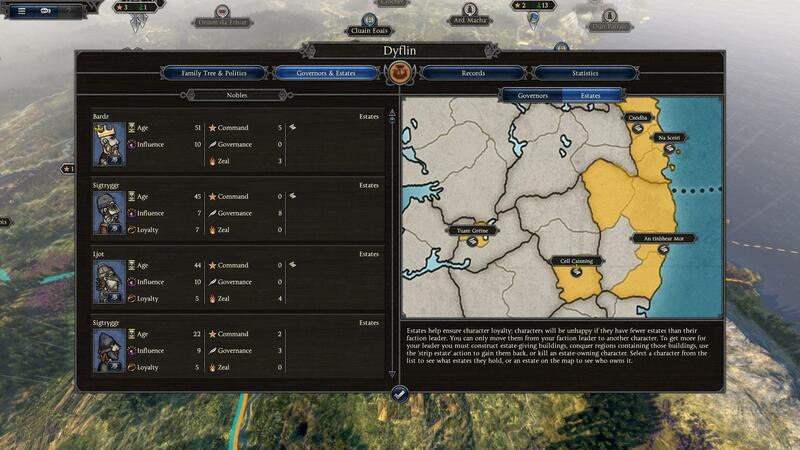 You can click on a faction on the map or in the scroll-window in the bottom middle and it'll show you information about the faction and it's leader. You'll see the strength ranking, trustworthiness, various factors that influence the faction's diplomatic actions and their alliances and enemies. The way to find out if someone likes you or not is by looking at the bottom middle window and hovering over the face (shades of reg, orange and green) under 'relations'. This shows how much a faction hates/likes you and why. Things like war, treaties with friends/enemies, trespassing, ect. all factor into this. Most options give information about them when you hover over them, so I won't be going into too much detail. Suffice to say there's alliances (defensive pact means you'll be asked to join eachother in a war if any of you are attacked, while a military alliance means that both when you are attacked or are attacking you'll be asked to join the war), miscellaneous options like friendship pacts and military access and then there's making vassal kingdoms and declaring war. I'll just give some basic tips: military alliances are risky as the AI can drag you into some really annoying wars, breaking any treaty will give you a big diplomatic pentalty with the faction, you can ask factions to break their pacts with other factions and: declarations of friendship are a pretty good way to get factions to like you. Most diplomatic options are pretty self explanatory which is why I didn't bother going into great detail. Playing the game for a bit will explain the different functions just as well as reading a guide, so go out and have fun exploring all your different options. 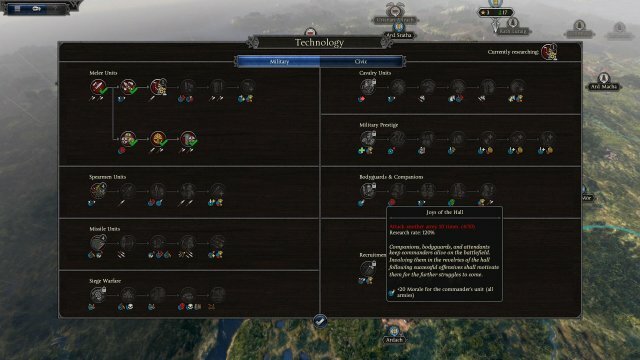 A pretty big change in ToB is the way technology and the tech tree is handled. The technology in ToB can only be researched after completing a kind of milestone to unlock the specific branch of research. To research melee infantry you need to recruit 10 melee units for example, something that wasn't implemented in previous TW games. The Technology tab (hotkey 6) shows you both types of tech trees that are available for your faction (different for every faction). You have the 'military' tech tree which contains technology that upgrades your units, recruitment, replenishment, ... and the 'civic' tree which boosts buildings, unlocks new types of buildings and gives various miscellaneous bonuses. You can only research 1 technology at a time and the amount of turns the technology takes to research depends on the technology itself and your research speed. You can speed up research speed by getting bonuses from characters with specific traits (a wife with the 'educated' trait gives 20% increase in research speed for example). Something else that is new to ToB is that the fact that research also has a downside. Research in ToB does not only give buffs, but it can also give penalties like increased upkeep cost, more corruption, ect. Before you research something always check if you can handle the penalty that may be associated with it. A last 'hint' concerning research is that when you rsearch new troops, you will have to retrain the 'older' troops that you had in your army. Retraining can be done by clicking on a unit card in your army that has a yellow arrow pointing up on it and then choosing the 'retrain' option. Technology has never been exceptionally difficult to grasp in any TW game. The more you have, the better. I've found that civic research can be difficult to achieve compared to military as military 'milestones' are way easier to get than the civic ones. You'll likely unlock most technology in a playthrough anyways, so don't worry and just have fun playing. The big battles and videos of 20 stack vs 20 stack are porbably why you chose to buy this game. This part of the guide will give an overview of the various military aspect of Total War Saga: Thrones of Britannia like raising armies, generals, unit types, unit stats, basic strategy, ect. 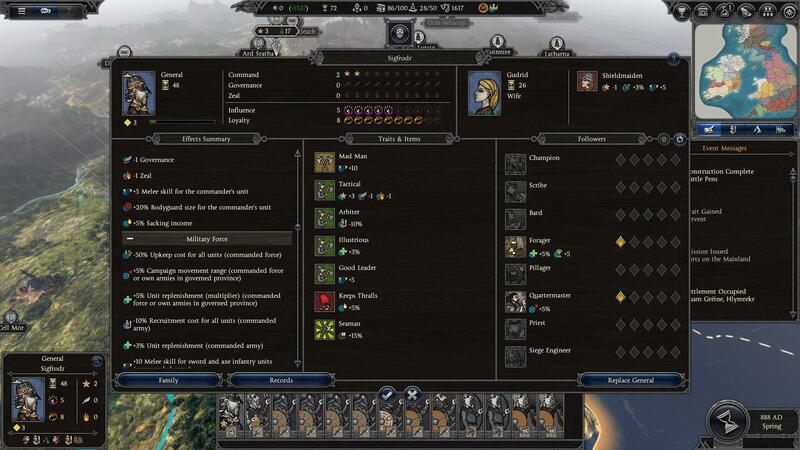 A first little piece of information is that to recruit a new army you need to click on the settlement you want to recruit your new army at (can be both a minor and major settlement) and then click on the 'raise army' button on the top left of the province window.When you do that you'll get to choose your general and then you can go and recruit units into the army. The Units: You can see in the middle window the units that make up your army. Clicking on them will show you their stats on the left side of the screen and above the portait of the units you'll see 3 circles: the top is 'disband', which will delete the unit, the middle is 'upgrade' which can upgrade the unit's weapons and armor (if you are in a provicne with a blacksmith building) and at the bottom you have 'retrain' which can change your unit into a better one once you've researched the next 'tier' of unit. Right clicking on a unit will open the TW Wiki and give you even more information. Action Points and Supplies: both of these bars can be found on the left side of the middle window. The green bar shows you the supplies your army has and the yellow bar shows you your action points. Supplies are used to supply your army. 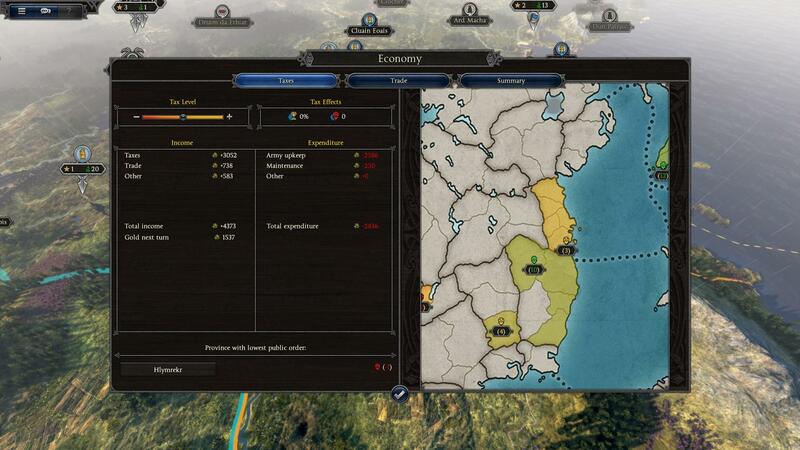 They depend on various factors like your general's skills and the territory you're marching through with your army. Foreign territory has a 'debuff' of -15 supplies which isn't easely offset by anything other than a really high rank general or assuming the 'raiding' stance. Action points show you how much your army can act this turn. Your army will use action points to move around, but also to take the various available stances. Stance, Recruit Units and General Details: These tabs can be found by clicking the 3 circles on the left of the middle window with the units. Stance: you can choose between 'none' (normal movement stance), 'fortify' (which enables you to recruit units outside of your settlements and increases replenishment) and 'raiding' (used in enemy provinces to take income and lower public order). Every stance has its own 'costs' to assume it (besides 'none') and you should always think about how many action points you have left before you try and take a stance. Raiding costs 25% of your action points and fortifying costs 50%. 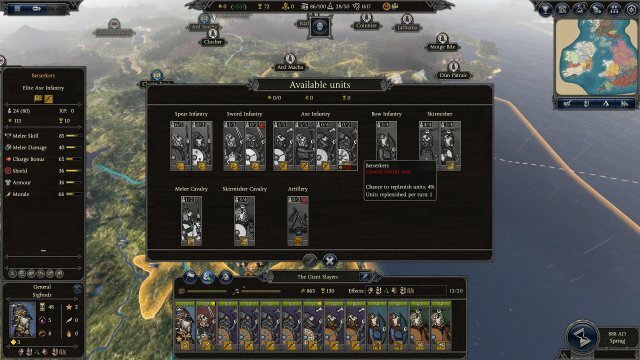 Recruit Units: Can only be done while in a settlement or in the 'fortify' stance. More information about the specifics will be given further in the guide. General Details: Gives you an overview of your general' stats, traits and his followers (= his skill points). More information further. Miscellaneous: Other information shown includes the gold upkeep per turn of the army, the food upkeep per turn, the name of the army, the effects (influenced by the general, faction, local province, ...) and also the amount of units in the army (X/20). 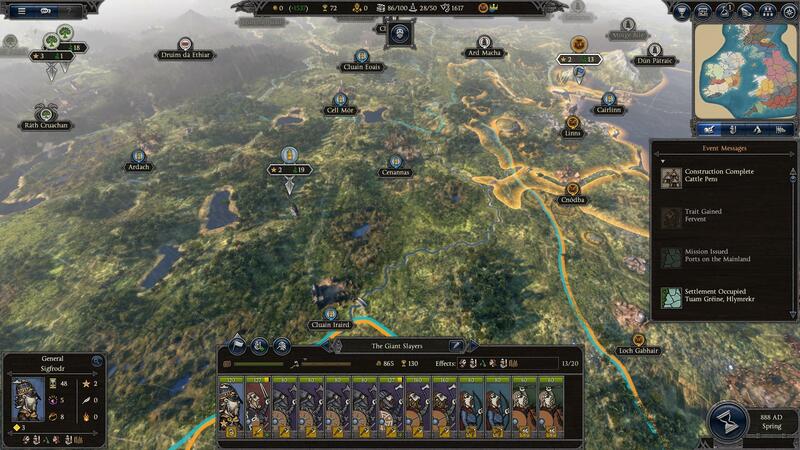 Every Total War game has a plethora of different units and ToB isn't any different. 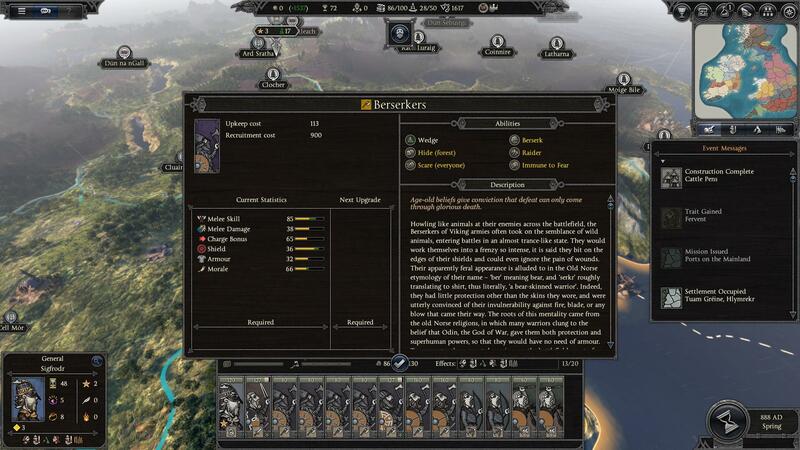 Each unit has different stats, abilities, upkeep cost and there are also different unit types. Unit Type: In ToB You have the choice between archers, skirmishers (javelinmen), spearmen, axemen, swordsmen, melee cavalry and skirmisher cavalry (javelinmen on horseback). Some factions have special units like Circenn's crossbowmen or the 2-handed shock infantry of the Vikings, but most of the units will belong to the first types. Unit Stats: Every unit has his own stats. The higher a unit's stats are, the better a unit is. What follows is a short explanation of what every stat does. Melee Skill: Combines the Melee Attack and Melee Defence of previous TW games into one skill. It governs how likely your units are to hit their enemy and defend against their enemy. Melee Damage: Governs the actual damage a unit does once it hits. A unit with 100 melee Damage, but 0 Melee Skill wouldn't hit anything even if he would one-hit kill any unit. If you hover over a unit's melee damage you will see 'Base Damage: X' and 'Armour-Piercing Damage: Y'. Armour-Piercing Damage ignores the enemy unit's armour and thus high armour-piercing damage is good against highly armoured enemies. Charge Bonus: A damage bonus that is added when you use a unit to attack another one. This bonus lasts for a short while and will 'refresh' after some time so that a unit can't just charge, go back, charge ,go back, ect. all the time ('cycle charging' is still a viable tactic used with cavalry). Shield: A new stat in ToB which influences how much your unit will suffer from ranged attacks and will also increase a unit's defence in melee. Armour: Defines how well your unit will take hits, both from ranged and melee attacks. Morale: This Will be the most defining stat in most battles. Historically armies would never fight to the last man and a rout would happen after X-percent of the army was killed, when people got ambushed from all sides, when they had terrifying things happen to them like being shot, ect. This is also true for TW games and means that using things like shooting people in the back while they're fighting your units, charging them in the back, totally surrounding them, killing their general, ect. will make them give up faster. When a unit loses too much morale they will start wavering (shown by a flashing flag) and eventually they'll rout (white flag) and break (grey flag). A unit is only done with fighting when he is broken (grey flag). The unit can recover from anything else (wavering/routing) and come back to fight. Special Abilities: These vary from unit to unit and can be seen at the bottom of the unit card or more easily when right clicking on a unit. The abilites range from active formations like 'Shield Castle' to passive abilities like 'Expert Charge Defence'. When recruiting a unit it's a good idea to check their special abilities. Recruiting Units: As mentioned before this can only be done when in a fortify stance or in a settlement. Recruiting units is done in the 'recruit units' tab. When recruiting units you just need to click on a unit and it'll be added to your recruitment list. 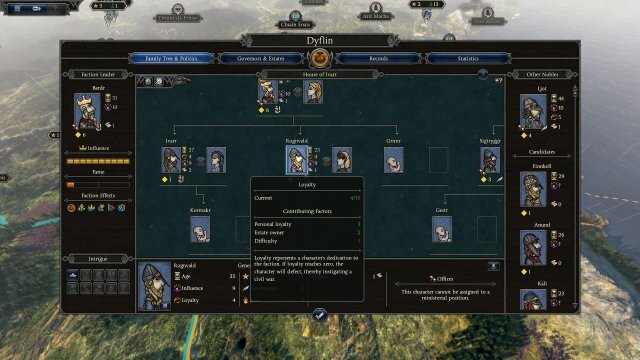 When you're done selecting units you can see the amount of money they'll cost to recruit, the upkeep they take and the food upkeep at the top of the tab. A new addition to ToB is the fact that units have a 'cap' and also need to replenish. The unit cap is dependant on technology while the unit replenishment rate depends on both technology and on buildings in your province. When you hover over a unit you will see 'chance to replenish units: X%'. This means that each turn the unit has a X% chance to get +1 unit available (but will not go above the cap). This means that you can't just willy nilly recruit and disband armies as your unit pool will decrease. As I mentioned before in the 'governors' part of the guide, each character has 3 main stats: command, governance and zeal. Command: this is arguably the most important skill for a general. It increases the General's Bodyguard size with 10%/ point of command (up to 100%). The bigger a general's bodyguard is, the stronger he'll be and the less likely he'll die. General's bodyguards are elite troops, so having 100% more of them doesn't hurt. It gives a morale increase as long as the general is alive and at 4 command it gives the ability to do 'night battles'. Night Battles are useful because they can cut an army off from reinforcements. Let's say you were fighting 2 full enemy armies with 1 of yours you could use Night Battle to destroy them one by one instead of having to fight both of them at once. Governance: literally useless for a general. Zeal: Increases the commander's aura and morale of the units inside of it. the commander's aura is a circle around your general in which your general's presence boosts their morale. When units are on the brink of routing it's a good idea to move your general close to them so that they stay and fight longer. As with governors, a good wife can help a general out a lot and each general has their own special traits. try to get a general with a good wife and decent traits and you'll be just fine. I could honestly make a full guide about just this one aspect of the game, so instead of making a military part 3 I'll just give a fast overview and leave you guys to figure it out while playing. Field Battle: This is the most common type of battle and will play out on an open field. Depending on the region you are in (and the benevolence of our Lord and Saviour RNGesus) you can have a slight (dis)advantage due to (not) having the high ground at the start of a battle (It's over Anakin!) or having to play in a forest (which is really bad for the speed of cavalry). Minor Settlement Battle: Different from other TW games, minor settlements don't have a garrison in ToB. This means that unless you put an army inside them, they'll instantly be taken. When you do put an army inside and get attacked, your battlefield will be a big open field and on your side of the map there'll be a cozy little village with a couple houses. The houses are a great way to make choke points or to funnel the enemy. It might not seem like much, but it's better than an open field most of the time. 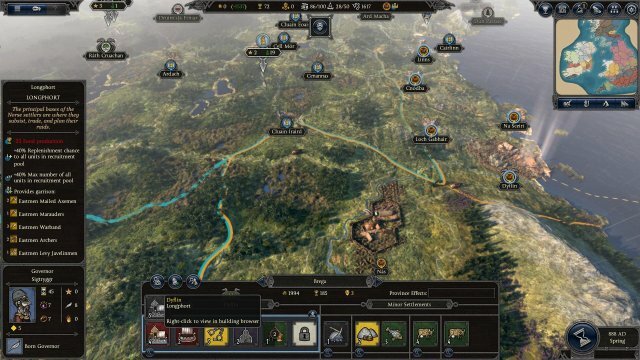 Siege Battle: Major settlements all have walls and will need to be besieged. You have the choice of recruiting artillery from the 'recruit units' tab or just besieging a settlement and making some siege engines (ram and tower) while besieging it. Making siege engines takes 'manpower', which is represented by 2 circular arrows. You have X manpower per turn (depending on the size and composition of your army) and each siege engine takes X manpower to make. You could surround a settlement and wait for it to surrender (the AI never does that, they'll always sally forth just before they surrender at the very least) or you could attack after having made some siege engines. Beware though: the defender always has the advantage in a siege and if we look at it from a 'player vs AI' perspective then the player should be able to hold off an enemy force at least twice his defending army's size. The AI has it a bit harder, but going 1:1 against a siege is sometimes risky. An important thing to point out is that siege battles always have towers on the defending side. These towers might just seem like annoyances at first, but they can kill a lot of your men if you just let them keep shooting you. Every capturable point during a siege is indicated by a flag and a circle, which can be captured by sending a unit in the circle and waiting. Amphibious Battle: A different take on the siege battle. When the major settlement you're besieging is a port, you can bypass the walls and most of the towers by attacking from the sea. This will mean that you'll have to land your units with ships on the nearby beach, but bypassing the walls might be worth it. Sea Battle: In most previous TW games you had dedicated navies and using a normal 'land' army for naval combat against an actual navy would pretty much guarantee you lost. In ToB dedicated navies don't exist though, which means you'll always use ships with land units on them. Naval battles are pretty much your ships boarding the enemy's ships and your men duking it out. In case you have archers with flaming shots, these can burn down boats, but it can take a while before the boats take fire and ultimately burn down. Naval Battles don't seem to have been a focus. Here I'll be giving the most basic of basic tactics that every TW player uses in their battles. Most of these are based on dealing morale damage and making enemies rout as fast as possible. Hammer and Anvil: the most classic tactic in all TW games. You pin the enemy units in place with your anvil (most of the time you'll use heavily armoured, well defended melee units for this) and then when the enemy has their backs turned, you maneuver a small detachment of fast, hard charging units (most of the time this'll be cavalry) to administer a devastating rear charge to the enemy units. This will do a lot of damage and will also make the enemy's morale plummet. Kiting: not sure how well this tactic works in this game (there are only horse skirmishers, no horse archers), but kiting means you'll use range units (which are faster than most melee infantry) to run around the map shooting at the enemy and then retreating when they get too close. Rinse and repeat until the enemy is dead. As I said, this game doesn't seem to really promote this tactic, but it might be a good idea to do it on a smaller scale with some horse skirmishers. Shooting them in the back: Not sure if this tactic has an actual name, but if your 'anvil' has all the enemy units anchored, you can have your range units go around the back and shoot the enemy in the back. This will make them take morale damage and also kill a decent amount of units off. Be sure that there is no enemy cavalry left though, as cavalry is the ranged unit killer in this game. If you let your archers shoot the enemy from behind your own units there'(s a change you'll kill some of your own units. positioning your archers properly is important. This pretty much ends the military part of the guide. If you want more in-depth information about battles I'm sure that battle guides not specific to ToB would also work and would be a decent help. A last small thing to point out is that if you attack an enemy, the AI will likely just wait for you to approach them on the battlefield, while if the AI attacks you, he'll be the one to come to you on the field. Pretty basic stuff, but it explains why the AI just 'stands there and does nothing' sometimes. Next Day: Survival - Factions, How Do They Work?